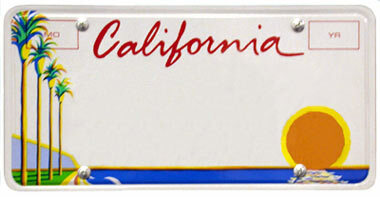 Blue and gold California license plate. Blue represents the sky and sea. Gold symbolizes the color of the precious mineral mined by the forty-niners from the hills of California. Gold is also the official state mineral, California's state nickname is "the golden state," and the golden California poppy is the state flower of California.